Home education Entertainment Lifestyle Love Why Quotes are Important in Life? 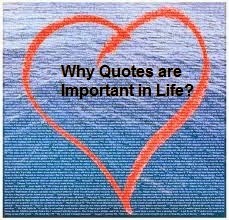 Why Quotes are Important in Life? By reading, we get to encounter quotes of authors. These quotes are often the things that catch our attention and we get to memorize them. I remember when I was a child and I get to memorize quotes from almost every author, cartoon character or actors and actress I encounter. I found it nice to live with these quotes and they also molded me into who I am right now – at least, a part of me. I bet you also have several quotes in life that made you complete. Say for example in terms of love, you will get to encounter a lot of love quotes that you might want to live by and apply them whenever you are already in a certain relationship. The thing is you have to be more serious in dealing with these quotes because talk is cheap. Sometimes we do talk a lot but apply nothing of what we are uttering. We have to be more aware of these things and in this way, we can say that these quotes are really effective. If you have a job that is stressful and you seem to feel a bit depressed, you might want to make use of the quotes that you can recall that will give you enlightenment. This is one of the reasons why I love quotes. I get to be calm in times of storm because I can make use of what are stored in my memories to be able to divert my attention and flee from self-pitying. This also makes me overcome a lot of obstacles and enables me to become a conqueror in every areas of my life.